Takayuki Yamada (left) and Tamaki Hiroshi (right) in MW. Standard commercial thriller that never takes advantage of its manga roots to become anything more substantial or noteworthy. Fans of cute stars Hiroshi Tamaki and Takayuki Yamada will likely experience better mileage. Osamu Tezuka created the manga thriller MW, but one wonders if the beloved "God of Manga" would have wanted anything to do with Hitoshi Iwamoto's 2009 big screen adaptation. MW takes Tezuka's work and mines it for your standard commercial film, complete with name stars, obvious expository dialogue, egregious plot holes and perfunctory chase sequences. MW should be a disturbing thriller that sticks to your gut, but this watered-down movie for the masses only works as a routine audience time killer. Given Tezuka's dark and even unsettling manga, this film version roundly disappoints. Nodame Cantabile's Hiroshi Tamaki stars as Michio Yuki, a banker who's secretly a brilliant, amoral criminal. We first meet Michio in Thailand where he executes a kidnapping-murder before going on the run from Japanese cop Sawaki (Ryo Ishibashi). Michio cleverly escapes from Sawaki (who's apparently the only cop in the entire country who'll bother to chase a bad guy), but turns up later at the police station as the bank officer who okayed the 100 million yen ransom. Sawaki is immediately suspicious, leading to your standard cop-versus-suspected criminal barbed dialogue that would never take place in the real world. 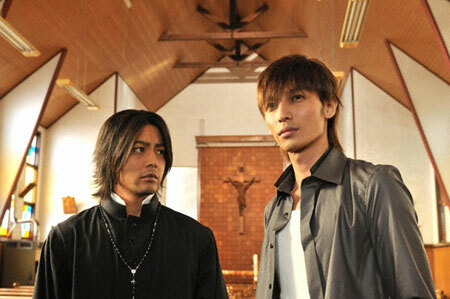 With Michio's grand scheme still unknown, the film heads back to Japan to check out its other protagonist, emo priest Yutaro Garai (Takayuki "Train Man" Yamada), who has gelled-up shoulder-length hair and wears stylish shirts like he's heading to the club right after evening fellowship. Michio regularly confesses his crimes to Yutaro, but Yutaro won't betray his confidence because the two share a deep, tragic connection. The two were childhood witnesses to a horrible incident involving a deadly nerve gas called "MW" (pronounced "mu"). MW killed off a majority of their island town, with the US and Japanese governments gunning down the rest of the survivors as part of a cover-up. Michio and Yutaro escaped, but Michio ingested some MW, and Yutaro blames his friend's present inhumanity on MW's aftereffects. The film portrays Michio and Yutaro as uncomfortably close, but never crosses the line into saying they're anything more. That's opposed to the original manga, which showed the two as having an explicit homosexual relationship, adding an extra layer to Yutaro's existence as a tortured man of the cloth. While the film Michio is not above using people, the manga takes his evil further, making him a wicked bisexual who uses his effeminate charms to bed both men and women to further his nefarious ends. Michio also graphically murders people and desecrates their bodies, while the movie Michio just shoots people in cold blood. Both the manga and movie Michios are bad dudes, but the manga version is a far more dangerous and chilling figure, and is a large part of what makes the MW story special. In comparison, the movie Michio is pretty tame. They say he's a monster, but he just comes off as coldly evil and not much more. Tamaki Hiroshi physically fits the character, but he brings inadequate charm to the role, and instead appears mostly smug. Without a compelling or charismatic villain, the film can't establish the proper credibility. Michio is supposed to be a guy who can worm his way into the confidence of just about anyone, but instead of Michio seeming brilliant and charismatic, everyone around him just appears stupid. As Yutaro, Takayuki Yamada isn't much help, spending the entire film brooding or acting morose. The connection between these two guys is the fulcrum on which the entire film turns, but the film can't convince of their relationship's strength or importance.